NOTE FROM THE AUTHOR: I’ve been working on a series of monoprints with collage and stitching.“there’s a crow flying” is inspired by Joni Mitchell’s song “Black Crow.” The poem, also, considers her song. 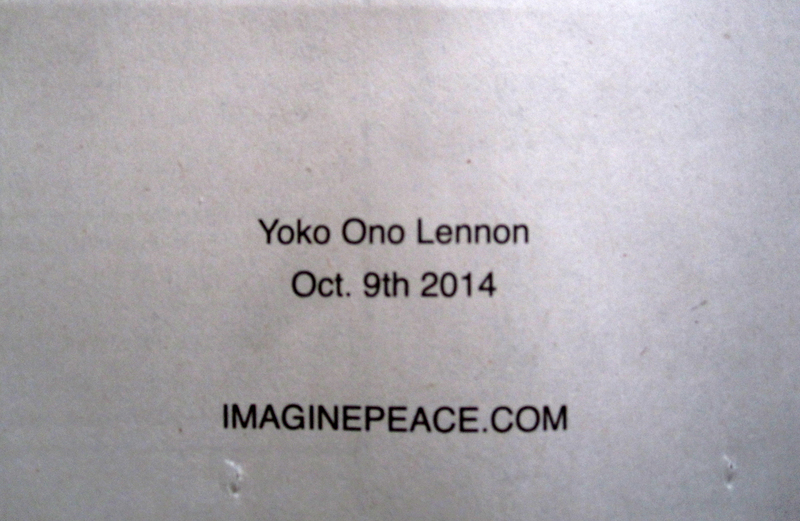 Yoko Ono placed an ad in the front section of the NY Times on October 9, 2014, John Lennon’s birthday. He would have been 74. It’s International Day of Peace, so I thought this headline haiku from two years ago would be worth revisiting. 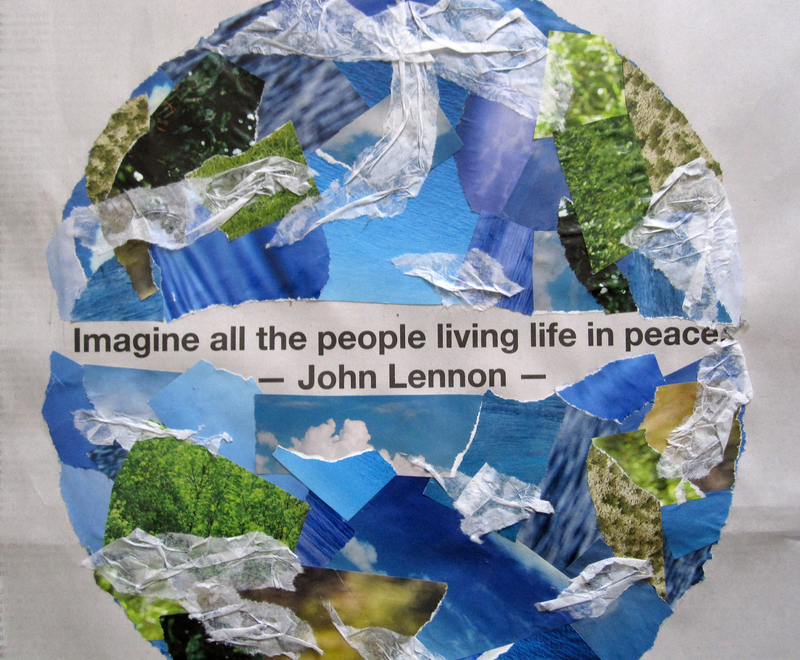 John Lennon’s words seem a perfect fit for Planet Earth, and I collaged the world around them. 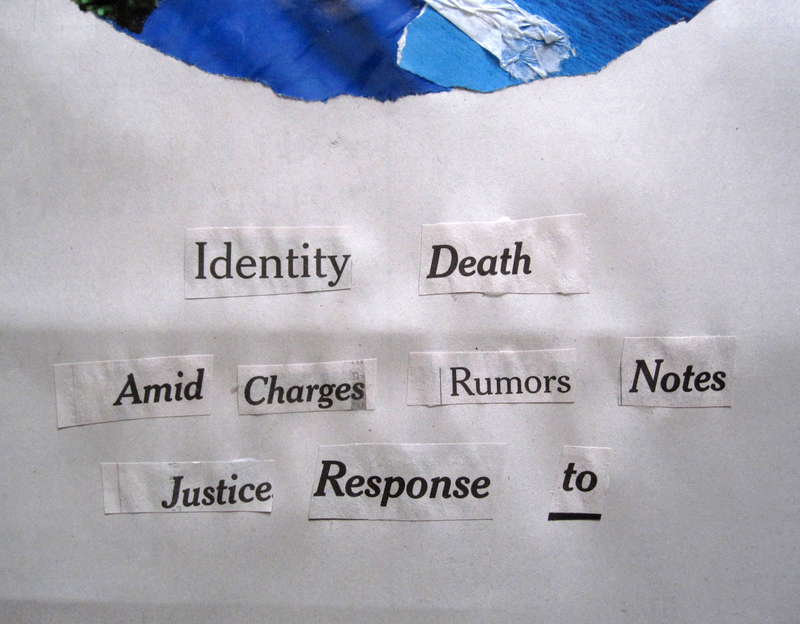 My original haiku (inspired by the surrealists) was cut from headlines in the newspaper section; the new one was composed this morning as I looked at the image and thought about its message again. So…give peace a chance, world leaders. Nina is still not ready to get back to art, so we’re taking a blog break. Don’t worry, we will return. Ronald Lockett’s “Trapped” series records the complex relations between humans and the living world. How do we treat animals? the environment? each other? I managed to visit the retrospective of Lockett’s found art last week at the Museum of American Folk Art, right before it closed. These are powerful works. Lockett felt the world deeply, as the works from his Oklahoma City bombing series, above, show. “You try to be honest about what you are trying to say,” he said about them. He acknowledged his debt to quilts in their construction. are reminders that the importance of bearing witness has no time frame. Lockett also made many tributes to those he knew and admired. Above, a work honoring Jesse Owens, intricately formed in tin. He painted “Instinct for Survival” when his brother went missing in the Gulf War. And his tin tributes to his great aunt Sarah Lockett, the woman that raised both him and his cousin, the artist Thornton Dial, reflect both her love of gardening, and her quilts. Ronald Lockett died in 1998 at age 32 from AIDS-related pneumonia. Jane Dougherty’s microfiction challenge this week once again provokes the question: what does she see? The quaking house shook me awake. After a long grey winter…it was seeking romance, fields of flowers, room to play, and spring. If anyone asks where we are going, just say outside and beyond sleep. Oh yes, that kind of thing could start again. lowly one day, no different from the others. all memory resolve itself in gaze. When I read Jane Dougherty’s response to Sue Vincent’s gate prompt (above), I immediately thought of “Hotel California“. I had already decided to do a Cento Poem, which takes lines from other poets and strings them together to make a new poem. I can’t explain completely my method for choosing these lines, except to say it involved a list of poets and a lot of randomness. I do like those surrealistic games. The result reminded me of a drunken conversation, hence the title and quilt template for the collage, which uses also the gate from Sue’s photo. I wouldn’t mind a hand stretched deep with song myself. Poets, in order of appearance: Robert Frost, Carol Ann Duffy, Basho, Seamus Heaney, John Keats, Philip Larkin, Richard Siken, Wang Wei, Denise Levertov, Richard Hugo, George Herbert, Louise Bogan, Langston Hughes. Shine and darken the sky. with vortex come helix come eye. 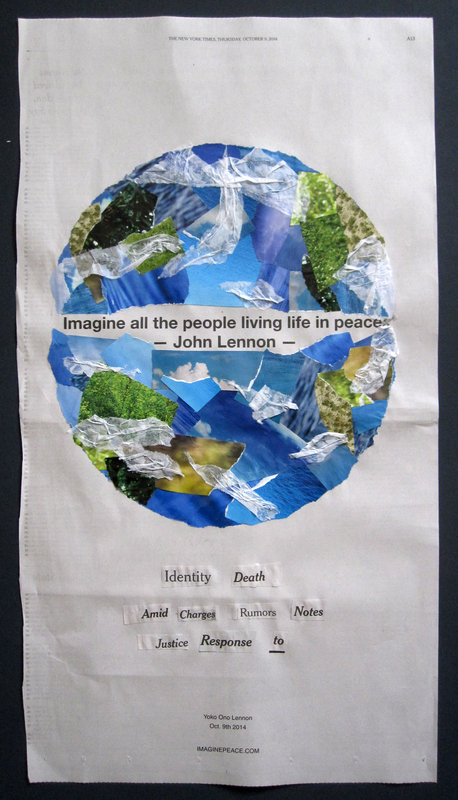 A circular poem and piece of art for Jane Dougherty’s poetry challenge this week. I only referenced the photo for the apples. Jill’s Art Journal informed me this morning that today is International Dot Day. Luckily, I had the unfinished collage above which fit the bill perfectly. I’m not sure where these dots are going, but for now they have a home. IMAGE: “Move,” collage by Kerfe Roig. NOTE FROM THE AUTHOR: Currently living in my 18th residence, I still have unpacked boxes, and boxes in storage, from the last move. Most of my moves have been as an adult, within New York City, so although the particular address changes, and the unpacking is always uncompleted, the city itself feels very much like home. Well, it just escalated from there. I have a box of animals too. I got the name “postcard fiction” from one of Merril’s commenters, who looked up microfiction to see how it was defined. It works for me!